Late blight is being found in many locations in Ontario. To help you identify it, here is a gallery of photos of the symptoms on tomato. Click on any photo to see a larger version. If you notice it early enough, you might see symptoms like these. Within a short time, with favourable conditions, you may see symptoms like those pictured below. In wet conditions, you may see the white powdery growth on the underside of the lesions. This is the pathogen producing spores. The disease can progress quickly, resulting in complete crop loss if uncontrolled. Fruit symptoms are shown in the photos below. Other related plants (potato, hairy nightshade, climbing nightshade, petunia), can be susceptible to late blight. 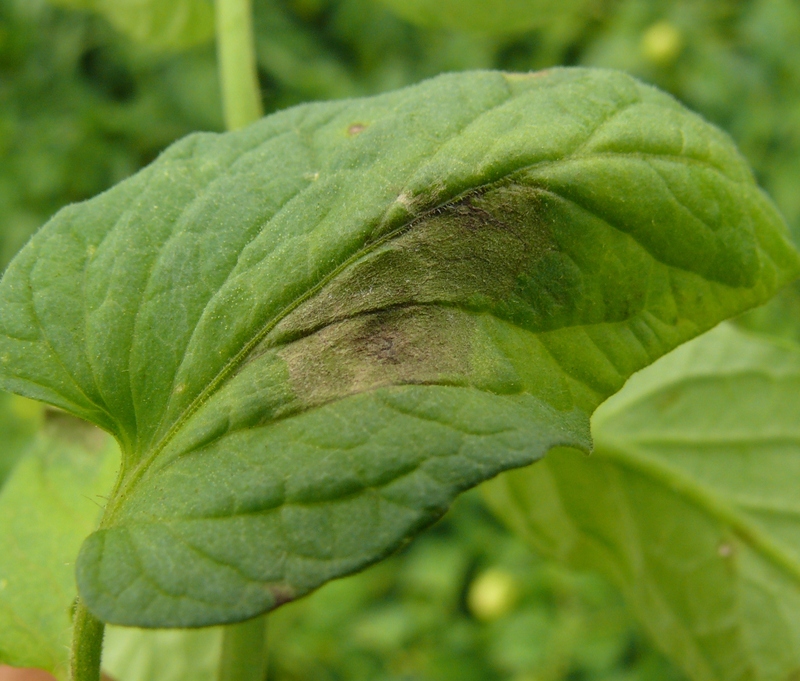 The photo below shows late blight symptoms on hairy nightshade. Photo credit: Eugenia Banks, OMAF&MRA. Late blight on hairy nightshade. E. Banks, OMAF&MRA. Should backyard gardeners be reporting suspected cases of late blight? If so, to whom? Yes — it is helpful to know where it is being found in the province. Then we can spread the word on the counties where it is being reported — and possibly get samples for Agriculture and Agri-Food Canada researchers. Reports can be posted here or emailed to janice.leboeuf@ontario.ca or michael.celetti@ontario.ca. Photos are helpful to include.